Hello, and thanks again for checking out my watch reviews! In this post, I will be looking at the Bliger 43mm Automatic Pepsi GMT Master II watch. The version I bought for review has a Chinese movement (possibly the DG3804B?). I purchased it via auction from ebay seller ‘yangjianhai20167’. 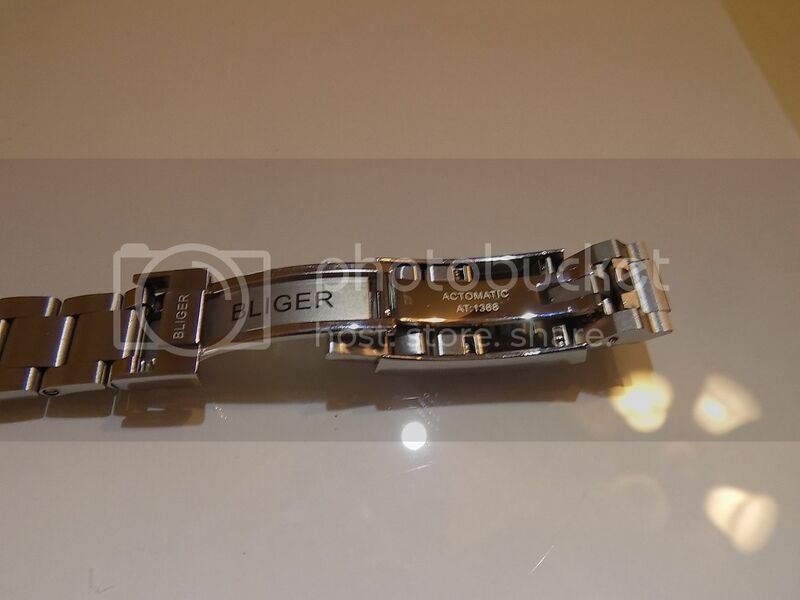 This is the first of two Bliger watches that I bought from this seller. Both watches came in individual plastic sleeves, then heavily wrapped in bubble-wrap pouches, and finally sealed inside a thick styrofoam shipping box. They were VERY well protected! No retail-box or papers were included. Bliger is new on the scene, like MANY Chinese ‘mushroom’ brands. You will often see them advertised on various internet stores. They are typically sold alongside brands like Debert, Corgeut, and occasionally Parnis. The product pictures looked very interesting to me, so I decided to investigate. As many of you probably know, internet pictures of Chinese watches be awfully deceiving, so I was a bit apprehensive. I searched high and low for a specific Chinese company that makes Bliger…but did not get anywhere. Against my better judgment (which seems to happen a lot with watches, flashlights, knives etc…lol), I decided to pull the trigger on this GMT watch (As mentioned earlier…I also purchased a second Bliger, a Sub homage, which I will review at a later date). The Bliger GMT Master II homage I received has a Chinese automatic movement, and is typically priced between $90-$150. CASE/CROWN/LUGS: The 316L (the ‘L’ designates low-carbon content) Stainless Steel case is listed at 43mm. The overall height is 14mm high (15mm including cyclops). The watch is definitely in the sweet spot of my size-range (I prefer a 43m). Yes…it is a big watch, folks…but seems to work just fine for my 7-3/4” wrist. Lug-to-lug is 52mm. The top of the case is brushed, and the sides are polished. The crown protector extends a bit at the 3 O’clock side of the watch, covering just over 1/2 of the crown. The large, screw-down crown is well-knurled and very easy to grasp. It is polished on the end and has no logo. CASEBACK: The screw-down SS case-back requires a Rolex-style tool to remove. I used the rubber-ball method to remove the back with ease. A single, black o-ring seal protects the movement from outside elements. Bliger gives this watch a depth rating of only 3ATM. Therefore, I cannot recommend this watch for diving. BRACELET/CLASP: The solid link, 21mm Stainless Steel oyster-style bracelet has screw-pins on five links for easy adjustability. It is fitted with a double-locking deployment clasp which appears to be well made. There is also a nice micro-adjuster underneath the clasp. The end links are also solid, which is a pretty nice feature at this price. All center sections and outside sections are brushed, and the sides of the links are polished. BLIGER logos are printed twice on the closure, as well as “Actomatic 1368”. I’m not sure if that is supposed to be some brand name for their watches/bracelets…or if they misspelled Automatic. DIAL/HANDS/INDICES/FUNCTIONS: BLIGER logo up top, and GMT AUTOMATIC/58 text down low. I am not sure what the 58 is supposed to stand for. The black dial has traditional GMT II, Rolex-style indices. They consist of an inverted triangle at 12 O’clock, rectangles at 6 and 9, and circles on the remaining hours. Each indice is raised with a silver edge, and a white, lumed center. A date window at 3 O’clock takes the place of the missing indice, and is easily distinguishable with the date-magnifier window. The date wheel is white, and has black Arabic numerals. The hour-hand is a typical Mercedes-style, with the minute hand a much longer sword-style, and the second hand, more of a lollipop/pointer with a small lollipop counter-balance on the opposite end. The fourth hand is the GMT, and a few mm shorter that Rolex’s version, but looks almost identical…with a red shaft, and silver lined triangle pointer. There are nicely lumed indices and hands, but the lume itself needs more staying power…but definitely a step above the lume on a typical Chinese timepiece. MOVEMENT: Chinese automatic with no markings, but appears to be a DG3804B (appreciate it is someone could confirm this for me). The rotor is audible off the wrist, and slightly audible while on. It has kept very decent time, gaining an average of 15 seconds/day. This movement spins like a friggin’ top…up to about 12+ seconds at a time, which keeps it well-wound. CRYSTAL: The sapphire crystal is flat, and has a cyclops (date-magnifier) at the 3 O’clock position. The crystal does extend above the bezel very slightly, approximately .3mm. There does not appear to be any AR coating. BEZEL: The aluminum Pespi bezel is half red (06:00-18:00)…and half blue (18:00-06:00). The colors look well done and are a pleasing hue. There is no GITD pip at the traditional, inverted triangle at the top spot, which is consistent with the Rolex version. Large, Arabic numerals are placed at even-numbered hours…and simple dots on the odd hours. The bezel has a gear-tooth style surround, which is sufficiently grippy. The bezel has approximately 72 clicks. The clicks are solid, and there is no rattling or slop. However, the bezel insert spins very slightly, under increased thumb-pressure, when rotating the uni-directional bezel. I don’t think this makes a difference on a 24 hr. watch (vs. diver), but it should have been fastened better. Pretty accurate automatic movement at +15 sec/day. Looks almost exactly like it’s Rolex counterpart. GMT hand independently adjusts, so watch could be used to keep track of up to 3 time-zones. Movement also hand-winds, and hacks. Protected and grippy screw-down crown. Bezel clicker has no slop and is uni-directional. Date function with easy-to-read cyclops. Decent, screw-pin bracelet with solid end-links/bracelet links and hidden micro-adjustment. Blue lume on hour, minute, second hands and indices. Green lume on GMT hand pointer. Rotor spins and spins and spins. Other color combos to choose from. Bezel insert rotates slightly under heavy pressure. In conclusion, the Bliger GMT Master II homage is a substantial watch with huge bang-for the buck. While there could be some improvements made, it has many nice features that cannot be found on other timepieces at this pricepoint. It offers a great deal of watch for the money. It just looks good, operates adequately. Hey Buddy!, I found this information for you: "Review: Bliger ‘Pepsi’ GMT Master II Homage Watch". Here is the website link: https://www.coolwatchbrands.com/2019/01/21/review-bliger-pepsi-gmt-master-ii-homage-watch/. Thank you.